Diageo is a global player in marketing alcoholic beverages. It holds big brands like Guinness, Johnnie Walker, and Smirnoff. The company had sales of € 15 billion in 2013, with a strong growing emerging market presence. Bespoke Post is a online subscription-based product box startup. The startup has a highly targeted approach for selling gift boxes filled with artisanal, high-grade products, both food and non-food, to young US career makers with cash to burn, aged between mid 20’s to mid 30’s, and mostly male. This startup landed a seed round of US$ 850k early 2013, and is probably still figuring out how to generate revenue. The big question is: what on earth are the elephant and the mouse trying for on the dance floor?! But something odd is going on. With this given partnership foundation (the bottom 3 building blocks), it’s impossible to come up with a logic what new value this combination would be able to create. Couldn’t Bespoke Post just purchase the liquor, put one of their own staff in the video, and sell the box themselves, or vice versa? Is this actually a partnership? Prompted by this caveat in the partnership logic I looked a bit closer at the Alchemy box. If you look at the box content, you’ll find that there is actually no liquor in the box. It’s just the hardware that gets sold with the Alchemy box, accompanied by some mix recipes, which promote the well-known branded alcoholic beverages. So what’s this all about? There must be some other value that gets exchanged to make this a partnership. The answer comes from elsewhere. Digging into some articles on the legal constraints imposed on marketing alcoholic beverages, I found this Wall Street Journal blog article, which explains new legislation for advertising, and marketing alcoholic beverages on social networks. Apparently alcoholic beverage advertisers have to meet a requirement that at least 71.6% of the social media advertising audience is old enough to legally drink alcohol. That’s quite a tricky limit to take heed of. A company could find itself easily crossing that limit, be it intentionally or not. A partnership is not about the transaction between 2 businesses. It’s about a non-monetary value exchange that takes place between partners. … but don’t leave your thinking at the foundation. Also think about the value that needs to be created based on this foundation. A partnership needs to create some new form of value as a result of connecting the existing values that partners contribute. By connecting all 4 building blocks of a partnership in a single logic, you will make surprising discoveries on what the true color of a partnership is. 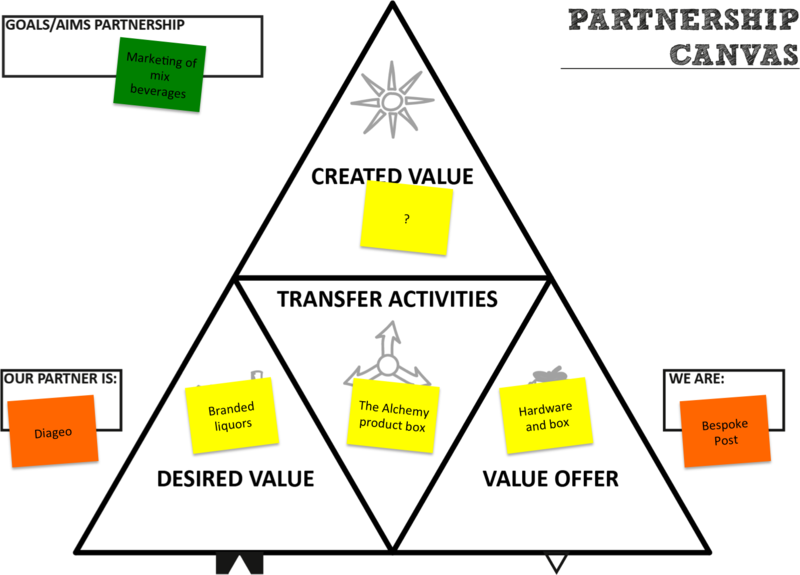 If you’re interested to explore partnerships for business model innovation, you can read the primer on the partnership canvas and download it.